Ecuador’s President, Lenin Moreno, has accused the recently arrested founder of Wikileaks, Julian Assange, of using the Ecuadorean embassy in London as a "centre for spying". Speaking to the British press this weekend, President Moreno claimed Ecuador's old government provided facilities within the embassy "to interfere" with other states. Radio Sputnik has discussed the issue with John Steppling, journalist and political commentator. Sputnik: Ecuador’s president has accused the recently arrested founder of Wikileaks, Julian Assange, of using the Ecuadorean embassy in London as a centre for spying. Firstly how true are these claims? John Steppling: The claims are completely ludicrous at this point. Ecuador had previously granted Assange citizenship so all of these actions; cutting the internet off, limiting visitors and so forth, were really in violation of his rights as a citizen of Ecuador. Clearly, this has all become very symbolic and Assange has become a kind of figure for free speech, quite rightly, and none of this has anything to do with what one thinks of Assange. He was fitted up for this Swedish sexual harassment case, which Sweden dropped and dropped in 2015, and wanted to drop all the way back in 2013. It was a ludicrous charge to begin with but varying factions seem to want to collaborate with this almost fascistic repression of Assange's rights. The fact that the US wants to extradite an Australian citizen, a journalist, on this kind of almost laughably preposterous charges of collaborating with Chelsea Manning for spying… there are no grounds, there's no evidence, it is clearly revenge against Assange and what he stands for. Sputnik: These accusations represent a string of absurd claims Ecuador's president, who also made references to Assange's apparently poor hygiene. What’s the logic behind these allegations? What benefit does it provide Moreno and moreover the legitimacy of Assange’s arrest? John Steppling: Moreno clearly wants to curry favour with Washington — that's obvious and barely denied. He wants an IMF loan, he wants cooperation with the United States on various economic matters, he's a new ally of the right-wing vanguard, Bolsonaro and Colombia as well… he's in line with all of that. The charges of Assange; the lack of hygiene and he's not washing and his cat is misbehaving… I mean, these are the predictable sort of kitsch details that are always trotted out when there are political enemies being demonized and that's what's going on. This is a draconian arrest. It's just an appalling example of overreach and as I say, the United States has no justification here for being involved at all. Assange is an Australian and an Ecuadorian presumably still, but the US feels it is entitled to do what it wants and it has the power to enforce that desire. 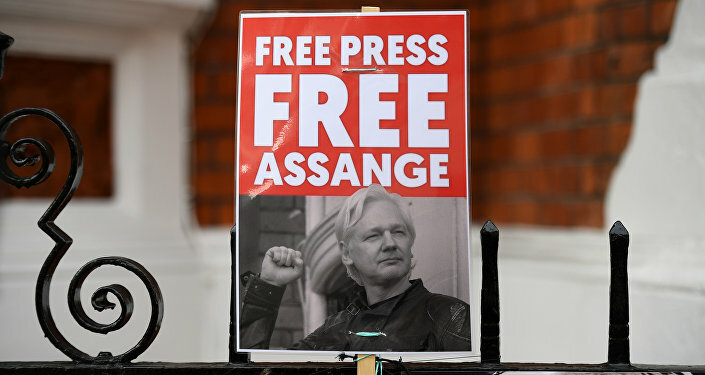 Sputnik: We’ve seen a number of high profile celebrities come out in support of Assange; what effect will this have on the case and moreover – what does his arrest last week mean for the future of whistleblowing? John Steppling: This egregious suppression of free speech and this overly punitive prosecution of a guy who really hasn't done anything that warrant anything close to this level of punishment. The fact that he had to take shelter in the embassy, to begin with, is something that's not talked about very much and that goes back to the US pursuit of him that he penned was in a bail violation or something. These are just trumped up laughable charges and everybody kind of knows that. In terms of that what this represents for the future it's a really horrific and frightening test case, in a sense trial balloon, because if they get to disappear Assange, if he is tried secretly and then sent to some Supermax prison, this suggests that future whistleblowers can expect much the same thing. I mean, it's all just ludicrous. Whatever they can find they're throwing at him. It's meant to frighten other whistleblowers. It's meant to frighten other journalists and it may very well succeed in doing that. The views and opinions expressed in this article are those of John Steppling and do not necessarily reflect those of Sputnik.